The Pin Brinell tester is the first Brinell hardness tester at a low price. 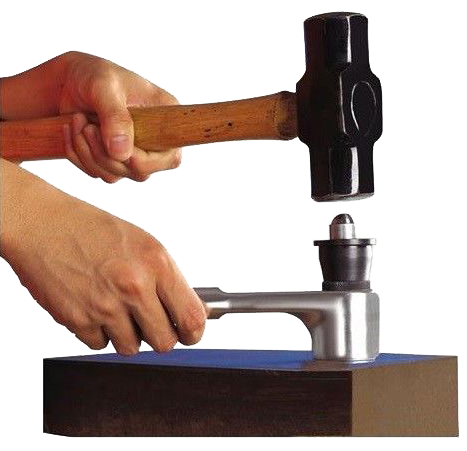 The unique impact hardness method, uses a shear pin to control the force applied by a hammer, so it significantly reduces the costs of getting started in Brinell testing. The indentation left after a test is measured with a Brinell scope, just like a standard Brinell, so the tester can be used on non-homogeneous metals and as-ground test surfaces. 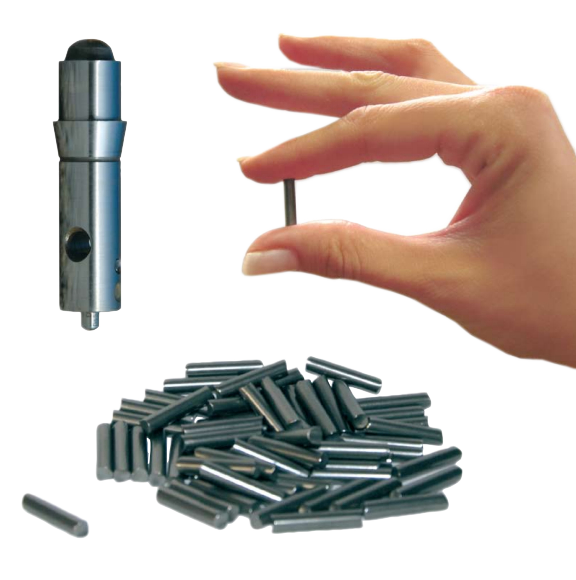 one pin is required for each test & we provide a bag of 500 nos pins. Each shear pin is precisely tested twice for accurate load application. Load accuracy is +/-1% of load — more accurate than competing models. Tester can be verified on standard Brinell blocks from HB100 to 700 (higher ranges using optional carbide indenter). Uses the same indenter diameter to load ratio as is used in regular 3000kg Brinell hardness testing. Very portable for use almost anywhere. Pin Brinell testers have been used for decades in the USA and worldwide by thousands of companies. They were originally developed by the Ernst company making testing much lower cost than the only alternative at the time, the impact bar method. Today there are knockoffs of the Pin Brinell due to its popularity, but the trade-off is quality – a tough choice to make when the product is meant to check the quality of your products. Operation: The operator inserts an impact pin (above right) into the impact head and presses the indenter against the pin, puts the impact head into the impact sleeve and puts it into the holder. The unit is placed on the test location and hit firmly with the hammer. The indentation in the sample is measured with the Brinell scope and a Brinell hardness result is read off the enclosed chart for the measured diameter. Prior to performing a second test the operator must remove the broken shear pin and push the indenter out of the shear pin hole, ready for the the next shear pin.